Major airports have become key nodes in global production and enterprise systems offering them speed, agility, and connectivity. They are also powerful engines of local economic development, attracting aviation-linked businesses of all types to their environs. These include, among others, time-sensitive manufacturing and distribution facilities, such as aerospace, biopharma, electronics, and e-commerce; hotel, entertainment, retail, convention, trade and exhibition complexes; and office buildings that house air-travel intensive executives and professionals. The rapid expansion of airport-linked commercial facilities is making today’s air gateways anchors of 21st-century metropolitan development where distant travelers and locals alike can conduct business, exchange knowledge, shop, eat, sleep, and be entertained without going more than fifteen minutes from the airport. This functional and spatial evolution is transforming many city airports into airport cities. As more and more aviation-oriented businesses are being drawn to airport cities and along transportation corridors radiating from them, a new urban form is emerging — the Aerotropolis — stretching up to 20 miles (30 kilometers) outward from some airports. Analogous in shape to the traditional metropolis made up of a central city and its rings of commuter-linked suburbs, the Aerotropolis consists of an airport city and outlying corridors and clusters of aviation-linked businesses and associated residential development that feed off each other and their accessibility to the airport. A number of these clusters such as Amsterdam Zuidas, Las Colinas, Texas, and South Korea’s Songdo International Business District have become globally significant airport edge- cities representing planned postmodern urban mega-development in the age of the Aerotropolis. These airport edge cities and other significant aerotropolis commercial nodes are reorienting the metropolitan center as they attract substantial concentrations of business functions previously confined to central city downtowns. 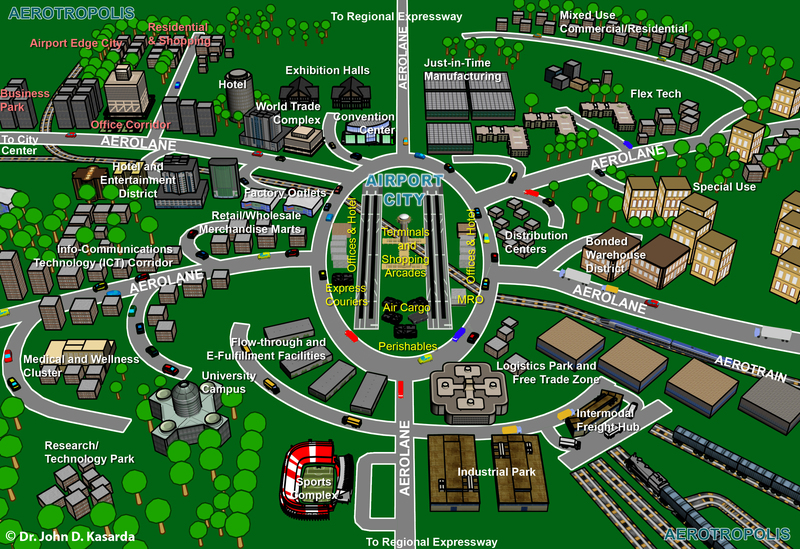 A spatially compressed model of the Aerotropolis showing its current and likely future evolution is illustrated below. No Aerotropolis will look exactly like this but most will eventually take on similar features, led by newer “greenfield” airports on metropolitan peripheries less constrained by decades of prior surrounding development. The Aerotropolis is therefore much more of a dynamic, forward-looking model than a static, cross-sectional model that often reflects historic airport area development before air commerce played such an important economic role. It is likewise more than corridors and clusters of aviation-dependent commercial, industrial, and logistics facilities. The aerotropolis also encompasses living urban places that must be designed as appealing environmental and social realms if the model is to achieve its full potential. Since economic sustainability is a prerequisite for development success, the aerotropolis must further be planned and administered to appeal to the business logic of investors, commercial real estate developers, and their facility end-users. 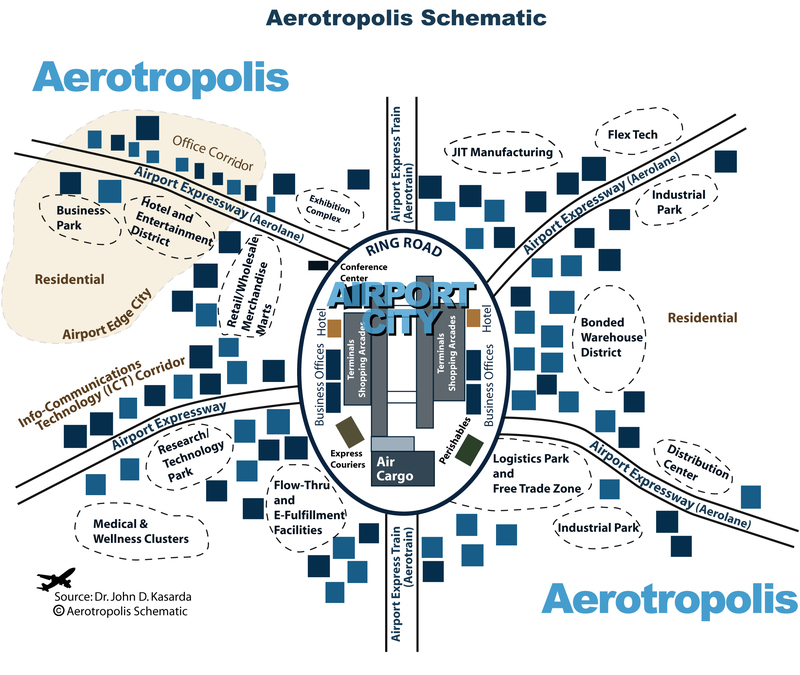 Thus, the Aerotropolis model is not simply a commercial land-use framework. It is, in fact, an integrated planning and development strategy that brings together and reconciles 1) the business site and profitability objectives of firms making capital investments, 2) airport and surface transportation objectives of ensuring maximal access to the airport and to local and distant business sites at lowest possible time and cost, and 3) urban planning objectives of livability, environmental sustainability, and social vibrancy. Economies of speed are as important as economies of scale and economies of scope for firms, cities, and metropolitan regions to compete. 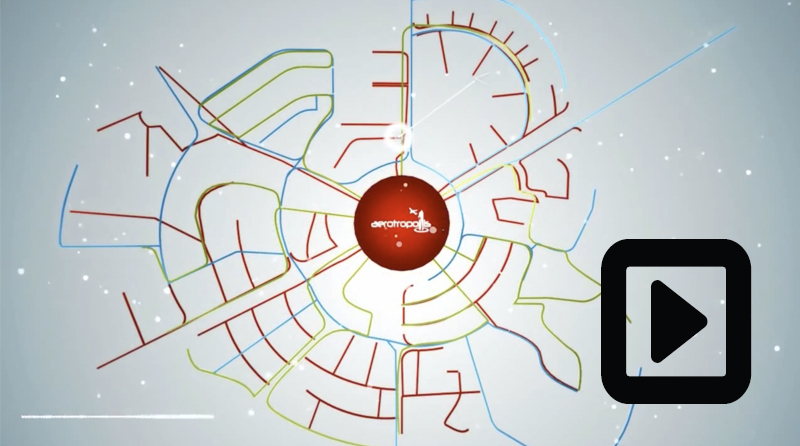 The primary metrics for aerotropolis planning are not space and distance, but time and cost of connecting to suppliers, customers, and enterprise partners — locally, nationally, and globally. A well-designed aerotropolis functions as an “urban pipe”, minimizing the time-cost frictions of space and distance, thereby increasing both firm and regional operational efficiencies. Businesses should be steered to locate in proximity to the airport based on their frequency of use to reduce traffic while improving time-cost access. Dedicated airport expressway links (aerolanes) and airport express trains (aerotrains) should efficiently connect airports to major regional business and residential concentrations. Special truck-only lanes should be added to airport expressways, as should improved interchanges to reduce congestion. Airport-area goods-processing activities (manufacturing, warehousing, trucking) should be spatially segregated from white-collar service facilities and airport passenger flows. Noise and emission-sensitive commercial and residential developments should be sited outside high-intensity flight paths. Cluster rather than strip development should be encouraged along airport transportation corridors with sufficient green space between clusters. Form-based codes should establish general design standards for airport-area buildings, walkways, travel lanes, landscaping, and public space. 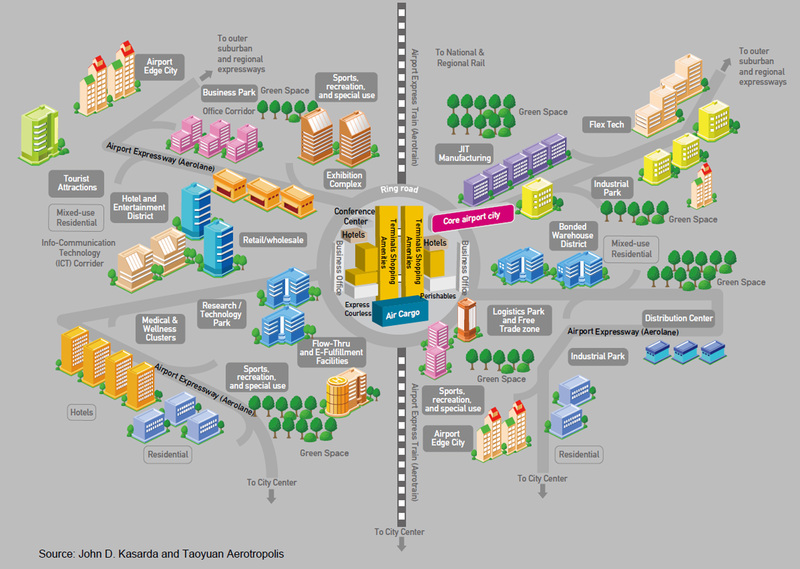 Placemaking and wayfinding enhanced by thematic architectural features, public art, and iconic structures should make aerotropolis developments interpretable, navigable, and welcoming. Mixed-use residential/commercial communities housing aerotropolis workers and frequent air travelers should be developed with easy commutes to the airport and designed to human scale, providing local services, urban amenities, walkability, and sense of neighborhood. Developing and attracting skilled labor and talent must complement infrastructure and logistics improvements for the aerotropolis to move up the commercial/industrial value chain. 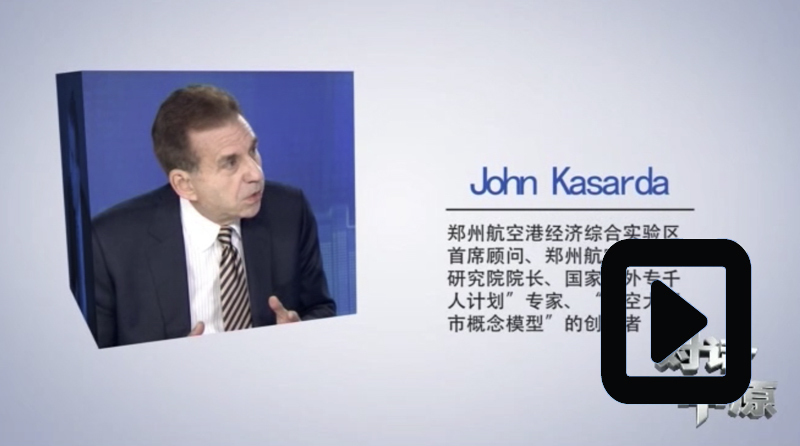 A globally competitive aerotropolis will not likely evolve on an ad hoc basis. Rather, it needs to be guided by a shared vision, strategy, and coordinated actions among the private, public, and institutional sectors. In absence of a capable and effective implementation organization, even the best aerotropolis development plans and strategies will fail. The bottom line is that aerotropolis development and “smart urban growth” that is economically and technologically efficient as well as environment-, resident-, visitor-, and worker-friendly can and should go hand in hand. The same can be said for improving matches between new aerotropolis businesses and endogenous airport-area workforces and economies through upgrading local labor force skills and developing community projects and services that appeal to air travelers. There are immense challenges, of course, to implementing an integrated aerotropolis strategy that will accomplish such outcomes along with others noted in the bullet points above. Yet, these outcomes will not likely occur under most current airport-area planning approaches, which tend to be localized, politically and functionally fragmented, and often conflicted. 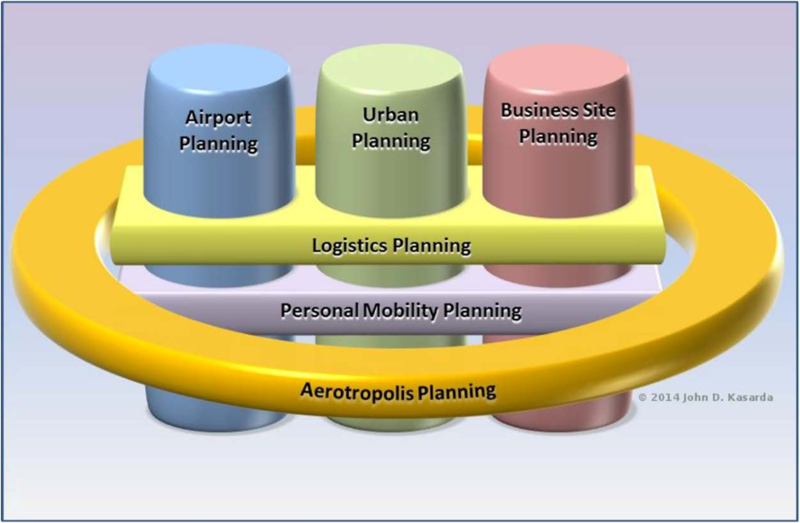 A more holistic approach is required, bringing together airport planning, urban and regional planning, and business-site planning domains in a synergistic manner so that future aerotropolis development will be more economically efficient, aesthetically pleasing, socially inclusive, and environmentally sustainable. The real question is not whether aerotropolises will evolve around major airports (for they surely will). It is whether they will form and grow in an intelligent manner, minimizing problems and bringing about the greatest returns to the airport, its users, businesses, surrounding communities, and the larger region it serves. "One of the ten ideas that will change the world." 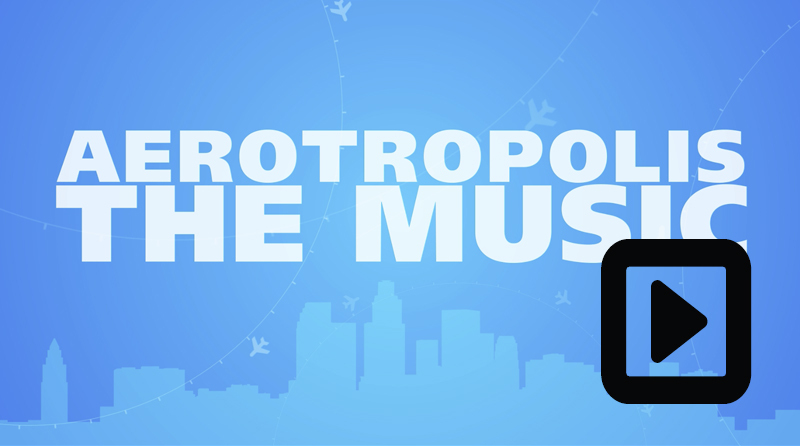 Based on Dr. John Kasarda's Aerotropolis model, this 3D video depicts the multimodal infrastructure, commercial, and residential aspects of the Aerotropolis. 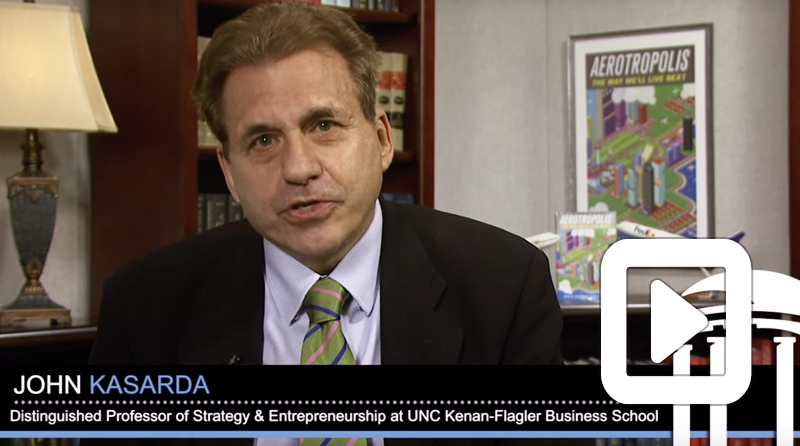 Kasarda and Evolve Media developed this video to demonstrate how airport planning, multimodal transportation planning, urban planning, and business site planning can be synergized to create a new urban form that is economically efficient, globally competitive, attractive, and sustainable. 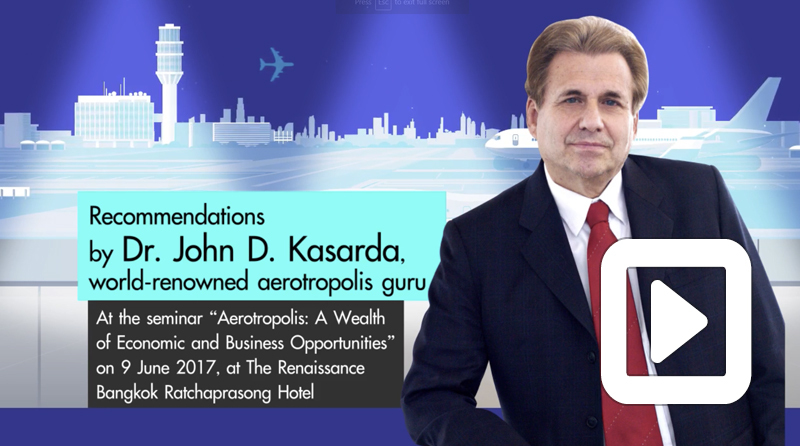 Video summary of John Kasarda June 9, 2017 seminar on Thailand’s Eastern Economic Corridor and U-Tapao Aerotropolis planning. An unexpected & surprising outcome - how aerotropolis development is influencing the global music scene.